To prevent cores of single-wall carbon nanotubes from filling with water or other detrimental substances, the NIST researchers advise intentionally prefilling them with a desired chemical of known properties. 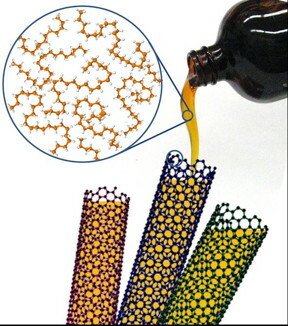 Taking this step before separating and dispersing the materials, usually done in water, yields a consistently uniform collection of nanotubes, especially important for optical applications. Just as many of us might be resigned to clogged salt shakers or rush-hour traffic, those working to exploit the special properties of carbon nanotubes have typically shrugged their shoulders when these tiniest of cylinders fill with water during processing. But for nanotube practitioners who have reached their Popeye threshold and "can't stands no more," the National Institute of Standards and Technology (NIST) has devised a cheap, quick and effective strategy that reliably enhances the quality and consistency of the materials--important for using them effectively in applications such as new computing technologies. The approach opens a straightforward route for engineering the properties of single-wall carbon nanotubes--rolled up sheets of carbon atoms arranged like chicken wire or honey combs--with improved or new properties. "This approach is so easy, inexpensive and broadly useful that I can't think of a reason not to use it," said NIST chemical engineer Jeffrey Fagan. The alkanes, which include such familiar compounds as propane and butane, served to render the nanotube interiors unreactive. In other words, the alkane-filled nanotubes behaved almost as if they were empty--precisely the goal of Campo, Fagan and colleagues. Yet, "spontaneous ingestion" of water or other solvents by the nanotubes during processing is an "endemic but often neglected phenomenon with strong implications for the development of nanotube applications," the NIST team wrote in a recent article in Nanoscale Horizons. "If your goal is to use nanotubes for electronic circuits, for example, or for fluorescent anti-cancer image contrast agents, then you require much greater quantities of materials of consistent composition and quality," Campo explained, who was exploring these applications while doing postdoctoral research at the University of Antwerp. "This particular need inspired development of the new prefilling method by asking the question, can we put some passive chemical into the nanotube instead to keep the water out." From the very first simple experiments, the answer was yes. And the benefits can be significant. In fluorescence experiments, alkane-filled nanotubes emitted signals two to three times stronger than those emitted by water-filled nanotubes. Performance approached that of empty nanotubes--the gold standard for these comparisons.